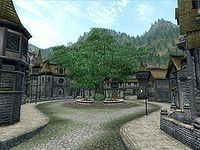 Chorrol is a medium-sized town in northwestern Cyrodiil, between the Great Forest of west Cyrodiil and the Colovian Highlands of the Hammerfell border. The city is divided into five main districts: Fountain Gate, Castle Chorrol, Chapel Street, West District and the Great Oak Place. Situated in the rugged highlands of Colovia, the city's grounds are strewn with large boulders that set the mountainous mood of the city as much as they serve as obstacles to pedestrians. The walls are well-fortified in anticipation against attack, with watchtowers placed at regular intervals along its length. 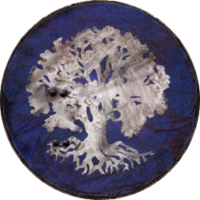 The ruler of Chorrol at the time of the Oblivion Crisis was Countess Arriana Valga, widow of the hereditary Count of Chorrol. Chorrol also appeared in ESO. 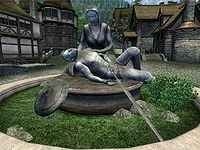 Separated at Birth: Investigate rumors around Chorrol that indicate some strange behavior on the part of one Reynald Jemane. Legacy Lost: Help long-lost twins recover their childhood home. Sins of the Father: A thief wants you to recover an item stolen by the Jemane brothers' father. Fingers of the Mountain: Sort out a problem with a former guild member to obtain a recommendation for Chorrol. Stendarr's MercyKotN: Retrieve the Gauntlets of the Crusader from the Chapel of Stendarr in Chorrol. 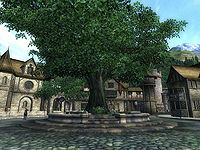 Sometimes when entering Chorrol, the entire south-west portion of the city walls and the nearby shacks will be permanently and completely missing. This allows exiting the city limits, but otherwise has little impact on gameplay. The only fix is to reload from before entering Chorrol and triggering the bug. Esta página foi modificada pela última vez à(s) 00h03min de 27 de dezembro de 2015.